Armenia is bordered by Turkey to the west and Georgia to the north. 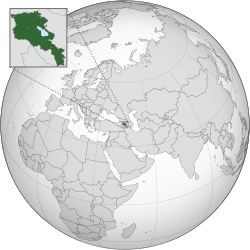 The de facto independent Republic of Artsakh and Azerbaijan is to the east, and Iran and Azerbaijan's exclave of Nakhchivan to the south. Armenia is a multi-party, democratic nation-state. It has an ancient cultural heritage. Urartu was established in 860 BC and by the 6th century BC it was replaced by the Satrapy of Armenia. The Kingdom of Armenia reached its height under Tigranes the Great in the 1st century BC and became the first state in the world to adopt Christianity as its official religion in the late 3rd or early 4th century AD. The official date of state adoption of Christianity is 301. Between the 16th century and 19th century, the traditional Armenian homeland composed of Eastern Armenia and Western Armenia came under the rule of the Ottoman and Iranian empires, repeatedly ruled by either of the two over the centuries. By the 19th century, Eastern Armenia had been conquered by the Russian Empire, while most of the western parts of the traditional Armenian homeland remained under Ottoman rule. During World War I, Armenians living in their ancestral lands in the Ottoman Empire were systematically exterminated in the Armenian Genocide. In 1918, following the Russian Revolution, all non-Russian countries declared their independence after the Russian Empire ceased to exist, leading to the establishment of the First Republic of Armenia. By 1920, the state was incorporated into the Transcaucasian Socialist Federative Soviet Republic, and in 1922 became a founding member of the Soviet Union. In 1936, the Transcaucasian state was dissolved, transforming its constituent states, including the Armenian Soviet Socialist Republic, into full Union republics. The modern Republic of Armenia became independent in 1991 during the dissolution of the Soviet Union. The Republic of Armenia recognises the Armenian Apostolic Church, the world's oldest national church, as the country's primary religious establishment. The unique Armenian alphabet was invented by Mesrop Mashtots in 405 AD. Armenia is a member of the Eurasian Economic Union, the Council of Europe and the Collective Security Treaty Organization. Armenia supports the de facto independent Republic of Artsakh, which was proclaimed in 1991. ↑ "The World Fact Book – Armenia". Central Intelligence Agency. Archived from the original on 19 July 2010. Retrieved 17 July 2010. ↑ "Statistical Service of Armenia" (PDF). Armstat. Retrieved 20 February 2014. ↑ 11.0 11.1 11.2 11.3 "Report for Selected Countries and Subjects". World Economic Outlook Database, April 2018. International Monetary Fund. Retrieved 11 January 2019. ↑ "Gini index". World Bank. Retrieved 11 January 2019. ↑ Armenia. Dictionary.com Unabridged. 2015. ↑ Stringer, Martin D. (2005). A Sociological History of Christian Worship. Cambridge: Cambridge University Press. p. 92. ISBN 0-521-81955-5. ↑ Smaller nations that have claimed a prior official adoption of Christianity include Osroene, the Silures, and San Marino. See Timeline of official adoptions of Christianity. ↑ Grousset, René (1947). Histoire de l'Arménie (1984 ed.). Payot. p. 122. . Estimated dates vary from 284 to 314. Garsoïan (op.cit. p. 82), following the research of Ananian, favours the latter. ↑ "The Constitution of the Republic of Armenia, Article 8.1". President.am. Archived from the original on 20 December 2010. Retrieved 30 December 2010. Wikimedia Commons has media related to Armenia. This page was last changed on 16 January 2019, at 15:29.